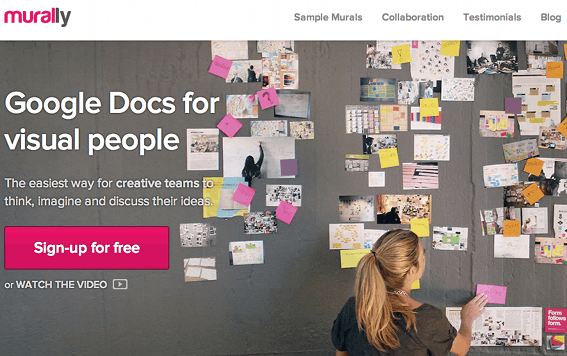 Mural.ly is a free, visual collaboration- and communication tool. The tool allows for multiple simultaneous users to communicate and collaborate on an online visual board. The tool is primarily suited for use within the polyphonic form of teaching. Within the polyphonic form of teaching Mural.ly can be used as a collaboration platform for groups of students or for an entire class. One of the major advantages of Mural.ly over other online collaboration platforms, is the great emphasis placed on the visual elements. It is possible to upload photos, to insert images directly from Google Image Search, to insert videos from YouTube and to insert various shapes, figures and Post-It notes on the board. It is also possible to connect ones Google Drive to Mural.ly, after which one can insert documents on the board. It is then possible to edit documents directly within the tool. By using the ' spaces ' in Mural.ly, one can divide the board into smaller fields, to make it easier to grasp the common work. It is possible to collaborate in real time. Collaboration is supported, among others, by the ability to add comments to the various elements placed on the board, and by the opportunity to chat with other users of the board. It is possible to mention other users in the comments and chat, after which they will receive a notification. Mural.ly is easy to use, and you can create a profile using a Facebook, Twitter or Google account. It is also possible to set up an account with an email address. If you need help getting started, you can watch an introductory video on the front of Mural.ly.